Co-written, starring, and directed by Ben Stiller, 2008's Tropic Thunder was a show business satire about a group of mostly conceited, self-absorbed actors shooting a war movie. When their director strands them in the middle of a jungle before getting killed, the actors find themselves in real danger from traffickers, who they believe are a part of the movie. Here are some facts about the film to read before you take that step back. 1. BEN STILLER FIRST HAD THE IDEA FOR THE FILM IN 1987. In 1987, Ben Stiller appeared in Steven Spielberg's World War II drama Empire of the Sun. He couldn’t help but notice that, at the same time, many of his actor friends were getting jobs in Vietnam movies, attending fake boot camps, and claiming it was a life-changing experience. Initially he had the idea of making a comedy about actors who go off to do war movies, come back, and are forgotten, paralleling the experiences of some actual war veterans. Then he realized that idea wasn’t funny. 2. KEANU REEVES WAS STILLER’S FIRST CHOICE FOR TUGG SPEEDMAN. Stiller considered casting Reeves as Speedman, and keeping the role of agent Rick "Pecker" Peck for himself. He later changed his mind. 3. ROBERT DOWNEY JR. BASED KIRK LAZARUS ON THREE ACTORS. At a press conference, Downey said he based Lazarus on three actors: Russell Crowe and Daniel Day-Lewis, “with a little” Colin Farrell. Lazarus was originally written as Irish; Downey changed him into an Australian because he was more comfortable improvising in that accent. When Stiller first pitched the idea of the character, Downey called it "The stupidest idea I've ever heard!" Stiller screened the movie to the NAACP, and received mostly positive feedback. 4. MOS DEF TURNED DOWN PLAYING ALPA CHINO. The actor and recording artist wanted to change Alpa Chino from a rapper to an R&B musician, but the writers disagreed. Def had already played a closeted gay rapper on The Boondocks. Brandon T. Jackson (who went on to play Grover in the Percy Jackson movies) took over. 5. TOM CRUISE CAME UP WITH THE IDEA OF HAVING A STUDIO HEAD CHARACTER. Stiller approached Cruise about playing the agent Rick Peck and sent him the script. Cruise thought it was funny, but wondered what the studio would be doing while all of the film's events transpired, so the role of studio head Les Grossman was created. It was also Cruise’s idea to give Grossman really big hands. After four days of makeup tests, Grossman's look was finalized. 6. OWEN WILSON WAS ORIGINALLY CAST AS PECKER. Wilson dropped out after an apparent suicide attempt. Matthew McConaughey replaced him. 7. STILLER OPTED OUT OF DOING A BOOT CAMP BEFOREHAND. 8. SOME SCENES WERE IMPROVISED. While Stiller and his co-writers Justin Theroux and Etan Cohen wrote the screenplay, there were purely improvised moments in the final cut. One was Jay Baruchel's Kevin Sandusky talking about the rise of Blu-Rays; Baruchel was talking about it on set and Stiller told him to do it in front of the cameras. 9. IT WAS MOSTLY SHOT IN KAUAI. The Hawaiian island was also used for South Pacific (1958) and Jurassic Park (1993). 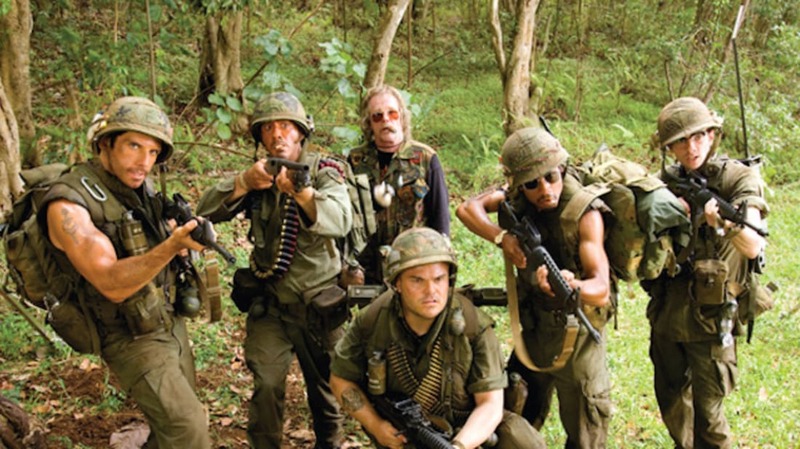 Tropic Thunder was the largest production ever staged on the island. 10. THE WATER BUFFALO WAS PREGNANT, UNBEKNOWNST TO THE CAST AND CREW. Bertha was flown in from Texas to play the animal Jack Black’s character Jeff Portnoy takes a ride on. Halfway through filming, the trainer called the set and announced that Bertha gave birth to a calf. In honor of Black, the calf was named Little Jack. 11. BLACK BRUISED A RIB. But it wasn’t from Bertha. "I was running with my big gun, and I dove into a foxhole,” Black explained to the Chicago Tribune. “I landed funny on the gun, and it bruised my rib. That bruise lasted six weeks. You cannot breathe all the way without it hurting." 12. BLACK WOULD TAKE A NAP AND LISTEN TO NPR WHEN PUTTING ON THE FATTIES COSTUMES. Filming the scenes from The Fatties—the movie within the movie in which Jeff Portnoy played the titular five characters—took three days. Black caught up on sleep while his prosthetics and make-up were being applied. Other times he passed the time listening to This American Life on his iPod. 13. STILLER ACKNOWLEDGED THAT IT WAS NOT AN EASY SHOOT. After shooting in Kauai for 13 weeks, Stiller handed out T-shirts to the cast and crew that read "I SURVIVED BEN STILLER'S COMEDY DEATH CAMP." A couple of people required hospitalization after getting centipede bites, and there was a constant fear of the Leptospirosis virus. 14. THE FIRST CUT WAS THREE AND A HALF HOURS LONG. At first, Stiller could only find 20 minutes that he would consider taking out. The theatrical cut was 107 minutes long. 15. CRUISE’S INVOLVEMENT WAS MEANT TO BE A SURPRISE. Cruise wasn’t in the trailer and no images of Grossman were in the press kits on purpose. Cruise’s lawyer threatened legal action to media outlets that posted leaked images of Cruise as Grossman before the movie debuted. It was traced back to an INF staff photographer. 16. AL PACINO WAS COOL WITH ALPA CHINO. 17. THERE WAS A MOCKUMENTARY CALLED RAIN OF MADNESS. Theroux played German filmmaker Jan Jürgen, a man looking to uncover the truth behind the disappearance of director Damien Cockburn (Steve Coogan) in the tie-in mockumentary inspired by the Apocalypse Now documentary Hearts of Darkness: A Filmmaker’s Apocalypse (1991). It was released on iTunes to promote Tropic Thunder, and came with its own website. Bill Hader played a studio executive and Janeane Garofalo made a cameo as a therapist. 18. PARAMOUNT PROMOTED DOWNEY IN CHARACTER FOR AWARD SHOW CONSIDERATION. ‘Kirk Lazarus’ was given his own "For Your Consideration" ads in trade magazines. It also doubled as a way to promote the DVD of the film, which featured a commentary with Downey as Lincoln Osiris and Lazarus. Downey ended up nominated for Best Supporting Actor, but lost to Heath Ledger for The Dark Knight.